Raiders captain Rob Smith is hoping his side can push on in the new year. WORTHING Raiders Rugby Club captain Rob Smith is hoping his side can secure victories in all of their remaining matches this season. Raiders have 14 games left in National South 2 and Smith sees no reason why his side cannot win them all. It was a indifferent start to the season for Worthing but they now sit sixth in the table, with nine wins and seven defeats. On the season so far, Raiders’ captain said: “It was quite a difficult start to the season for us as we had a number of players missing and Daws (head coach Kieron Dawson) was banned from the touchline for a few games. “Obviously, after dropping down from the division above, a few of the players may have thought it was going to be an easy ride but, once the season got going, we knew it would be a challenge. Raiders have managed to secure their two most valuable wins of the campaign in their last two games with victories over Dorking and Henley Hawks. Worthing ended leaders Henley’s unbeaten start to the season, before ending Dorking’s 14-game winning run the following week. Smith feels those successes have really helped to boost morale at the club and added: “I think the last two victories have really shown what we are capable of as a side. “We have been back to full strength in those games and we have ended the winning runs of really strong teams, in Dorking and Henley Hawks. 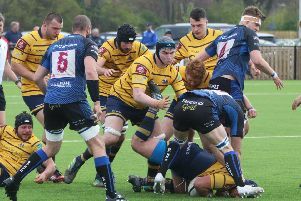 Raiders are 15 points behind both Henley Hawks and Dorking and Smith is now hoping his side can win all of their remaining matches. He said: “The aim for the rest of the season is to go out and try to win every single match. We know we have a side capable of doing that, it’s just a case of making sure we apply ourselves in every game. Raiders travel to Canterbury on Saturday (3pm).